“Me? 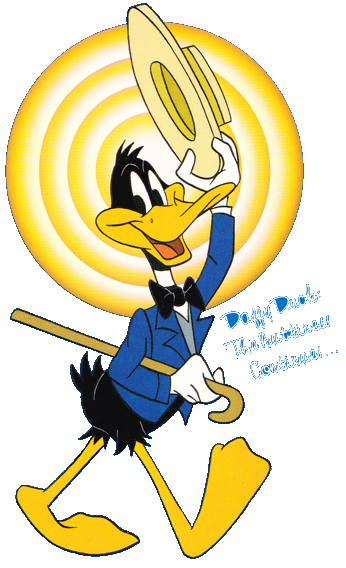 I’m just a crazy darn-fool duck!” With that remark, a wacky mallard made his movie debut in 1937. Now, thanks to home video, we can look back at this auspicious debut and trace the subsequent cartoon career of the immortal Daffy Duck. When Daffy Duck first appeared in Porky’s Duck Hunt, he was a frantic, screw-loose character—and he scored an instant hit with audiences. Just a year later, he was featured in such cartoons as The Daffy Doc, in which his penchant for outrageous gags reached its peak. By the time of The Scarlet Pumpernickel, Daffy Duck was tired of being typecast and tried selling his boss on a new idea—the Duck as Swashbuckler! It worked so well that cartoon director Chuck Jones tried Daffy Duck in a variety of guises, from super sleuth (in Deduce, You Say) to cowboy hero (Drip-Along Daffy). In his encounters with Bugs Bunny, Daffy Duck wasn’t quite so fortunate—though we are, for his flights of frustration in films like Rabbit Fire are among his funniest moments on film. And in the classic Duck Amuck, Daffy Duck suffers the ultimate indignities, caught at the mercy of a mischievous animator. Daffy Duck went through several phrases in his checkered cartoon career, but each change only revealed a funnier facet of an already first-rate character, marking him as one of the looniest members of the Looney Tunes family. All hail Daffy Duck!